These ARP stainless steel accessory studs can be used for exhaust systems, intake manifolds, and a number of other uses. 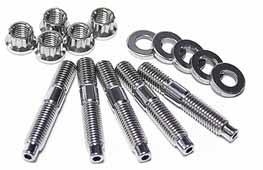 They are made of ARP's stainless 300 and are impervious to the rust and corrosion that plague ordinary fasteners. The studs feature a unique nut starter nose and a hex broached tip, which allows them to be easily installed using an Allen wrench. Stainless steel 12-point nuts and washers are included. ARP Stainless Steel Exhaust Manifold Stud Kit for the 7-bolt DSM/EVO.